Eidolons is a quirky alt-pop band from Portland Oregon, whose catchy music shows influences from 80s Brit pop (Smiths, Cure) to 90s West coast alternative (Shins, Death Cab), but yet sounds very contemporary. 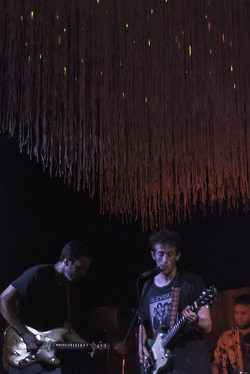 We caught them at Cameo Gallery a few weeks back on a Sunday night headlining gig. Their set alternated between tracks from their 2012 album China, and their new album Skyhook which was released in June. The band can change tempo and key on the dime and their talent bodes well for their future — or as the Portland-Mercury described them, “freaky potential”. I recorded this set in our standard location in this venue and the sound quality is superb. Enjoy! If you download this recording from nyctaper, we expect that you will PLEASE SUPPORT Eidolons, and visit their bandcamp page where you can purchase their official releases including the latest album Skyhook [HERE].